MRRC Long Bay: Corrective Health Services Health Services in NSW fares only slightly better than CHS in the US. But make no mistake they're both Prison Health Services. At Long Bay, Corrections medical facility, prisoners must stand in queue to receive daily medications, in the pouring rain, bitter winds and baking sun. Nursing staff performance is indifferent, perfunctory and often down right cruel. Prisoner's medical conditions are mandated to be confidential and a great show is made of locking up records, but in practice, are frequently the object of derision and the rude jokes made about behaviour modification effected by methadone addiction. Any medical certificate issued to a prisoner for a bona fide medical condition by a CHS doctor must be approved by the Deputy Governor. Often the request of these certificates, such as a heater in winter, are deemed frivolous and disallowed. It often takes two to three weeks just to see a doctor. Prisoners are locked outdoors five hours a day, and made to shower there, in all weather and seasons. 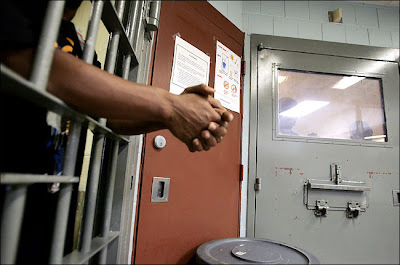 Prisoners are refused almost always any right to remain sick in cell. Fights and stabbings are not uncommon because of the discomfort. Hepatitis C is rife but prisoners are offered little nutrition by way of fresh food in Corrective Service Industries meals. CHS offers very few vitamins and makes them devilishly difficult to get. Recently, a Long Bay doctor was transferred after she was accused of "taking too much time" with prisoners. Prisoners on remand are offered no guidance on preventive dentistry such as the teeth cleaning recommended by the Australian Dental Association every six months. You can tell a crim by his/her teeth because prison dentists pull teeth rather than do root canals.